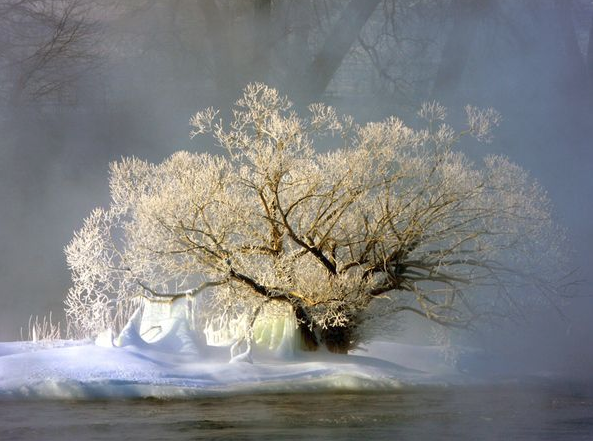 Water flowing freely around a wintry tree in Quebec. According to Chinese Medicine, pain results from a deficiency or obstruction of qi within the body’s meridians, which are much like rivers of energy. Acupuncture, lifestyle changes, and dietary wisdom create an unencumbered flow and relieve pain. Photo: Nat Geo. Last week, a new patient called my office in terrible pain from PMS, which she has experienced monthly for many years. She had already taken some over the counter supplements for cramps and bloating, was avoiding caffeine and dairy, but was continuing to experience severe symptoms. She wasn’t well enough to come in for a visit that day, so I gave her my advice on how to cure her cramps and bloating at home based on the wisdom of Chinese Medicine. The following day, she called me in amazement; her symptoms had subsided, and she was feeling completely renewed. I’m sharing the advice I shared with you – you’ll be amazed at how these small changes can make a real difference. A healthy period not only means feeling better when you have PMS, it effects your overall health and energy, and creates a healthier flow of emotions throughout the month. PMS and holistic health are not always words that people think of when battling the discomfort that comes this time of the month. 1. Soak your feet, up to your ankles, in hot water, at a temperature you can comfortably stand for twenty minutes. This can be done nightly for overall relaxation and circulatory health, but is particularly useful in the days leading up to and during your period. 2. Use a hot water bottle, or heating pad set to a comfortable warmth on your abdomen if cramps have already set in. 3. Prioritize good sleep, both in the days leading up to your period, and during. If this means putting sleep on your to-do list, do it! 4. Avoid cold drinks and raw foods (salads, ice water) for several days before and during your period, and you’ll notice less overall bloating. 5. Eat plenty of warm, cooked foods. Light soups, steamed vegetables and rice are ideal. This helps to maintain good energy and reduces cramps and bloating. 6. Avoid fried and heavy foods, as they are difficult to digest and can worsen digestive woes. 7. Drink plenty of room temperature and/or warm beverages such as ginger tea and peppermint tea to stay hydrated. 8. Avoid caffeine – including chocolate, coffee, and black tea. Caffeine consumption often worsens headaches and cramping, and also taxes the adrenals. 9. Avoid any strenuous physical exertion such as hot yoga. 10. Steer clear of stressors, both emotional and physical. Set proper boundaries for yourself to create a nurturing and calming environment. These lifestyle practices alone will go a long way to creating a healthier menstrual cycle. Visit your local acupuncturist the week before your period if you have a history of difficult periods, acupuncture can help ensure that you avoid symptoms before they start.